A wristcomputer similar to the PIP Boy 3000 from the game series Fallout. The PIP Boy 3000 from the game series Fallout also contains a geigercounter, but I do not think this is a realistic addition :( and it turns out this is actually doable :) More updates on this will follow soon. 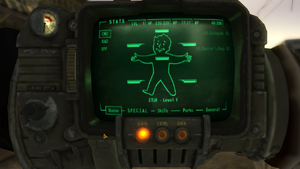 The 'PIP' in the name 'PIP Boy 3000' is an acronym for 'Personal Information Processor'. -To use the touch sensitive screen a stylus is... useful unless you have small fingers. -The option pages (Page_100-103) can be opened by touching/pressing the topright corner of the screen, there is a 5x5 px square (invisible) that activates it. -Before power up, check if the laserpointer is still properly connected. Its wires unplug rather easily. -To power it up, you do NOT need to plug in a USB cable into the Teensy 3.0 microcontroller. -I have cut the VIN trace, which means the Teensy is not drawing power from its USB cable, but from an external source. The external source is the Breadboard USB powersupply, which delivers 5v to the Teensy's 'Vin (3.7 to 5.5 volts)' pin. -To modify code on the microcontroller, you only need to connect the Teensy Micro-USB connection to a computer. -To use the PIP GRL 31415, you only need to connect the Breadboard USB powersupply, and flip the switch. When the device is powered up, the first thing it will ask is to select the proper password (Page_0). You have 4 tries, after which the device will enter 'bricked mode'. At the moment of writing, this is bypassable by restarting the device (ie. bricked mode is NOT permanent during prototype phase). Page_1, Page_2 & Page_3 are 'normal' pages which contain functions the enduser is able to use. Page_100, Page_101, Page_102 & Page_103 are 'option' pages, much like the settings screen of any computergame. The LOGIN page displays a list of characters and words, the password needs to be selected to continue. 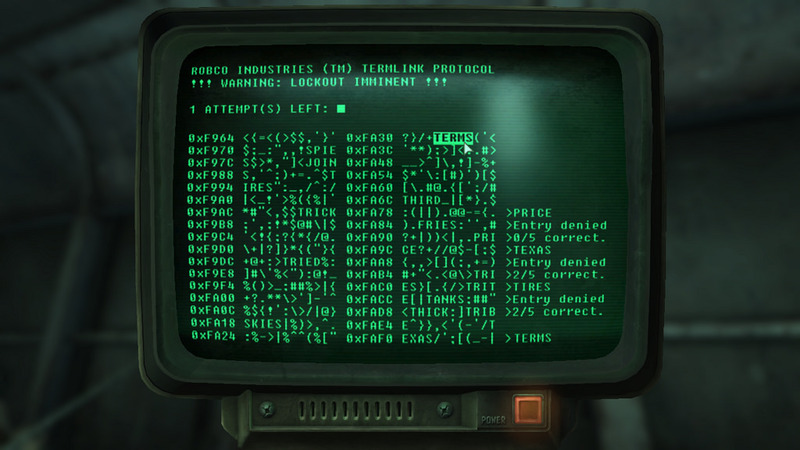 This page is a direct copy of the RobCo computer terminals primarily present in the game series Fallout (image). There has been a small change made, this device will not display the amount of correct characters in the chosen password as the game does. Displays amount of radiation absorbed, at the moment this is actually the average of 3 random numbers. The random numbers are readings from an analog pin without anything connected to it (noise). Currently working on this section. Will soon display 3 submenus, keyboard/mouse/joystick/gamepad. From these you will have the option to control ANY computer just by connecting a USB cable between the computer itself and the Teensy microcontroller. Thought for later: add a wireless connection, although this will probably require drivers to be installed (destroys plug&play functionality), and will probably consume much more power. 06/04/13: The mouse functions are implemented (with the exception of mouse-scroll up/down), and they work like a charm. Well... I could explain every key here, but that would be a waste of space. I will be working on a US International keyboard without numpad (not enough space on screen), so it'll probably become more like a laptop version. -Press CAPS or SHIFT for uppercase and/or other characters. -CTRL, ALT, SHIFT and the right WIN button are modifier keys, meaning when you press one, it will highlight, until you press another (non-modifier) key. -The left WIN button is a non-modifier key and functions as a normal single-press Super/Win key. -It is not possible to use multiple modifier keys at the same time. I still need to update the code to allow such outlandish behaviour. Having CTRL and SHIFT selected and pressing on the letter S will result in the key combination SHIFT-S being sent first, followed by a CTRL-S.
Buttons to simulate LMB, MMB, RMB press. Buttons to simulate holding down LMB, MMB, RMB to support Drag&Drop functions (press once to hold down, press another time to release). Buttons to simulate Scroll Up and Scroll Down. A bit of a weird one, Joysticks work on 6 axis, 32(!) buttons and 1 hat switch. I never worked with Joystick controls before, but I suspect I'll get it right first try (how hard can it be?). Joysticks work on 6 axis, 32(!) buttons and 1 hat switch, and all of these will be implemented. Will possibly contain statistics such as time used, SD space used/available and distance traveled (will be inaccurate, GPS doesn't always have a fix) and other fun statistics. The ITEMS page still needs to be filled, the layout exists but nothing has been added (yet). The Local Map displays a map of the Netherlands, and once the GPS has a fix, a rectangle will appear as a 'You are here' indicator. Same as the Local Map, except this displays a map of the world. The Quest menu should display your active/finished quests, but because I do not know how to implement this yet, I decided to add the Audio sensors output here. The code written for reading the microphones peak-to-peak is horrible, and doesnt function properly yet (should make use of interupts, not a timed interval). The Misc menu displays the values from the Light Dependent Resistor. The goal is to use this value to decrease the backlight on the TFT using a digital potentiometer automatically. The Radio menu contains all controls for the FM Radio. Turn on/off, Mute on/off, Seek up/down, Tune up/down, Volume up/down. It also displays the freq. you are listening to, and if this is a mono or stereo signal. At the moment RDS is not being processed, but will be in the near future. This page will be displayed if you choose the wrong password 4 consecutive times. -Backlight brightness level (not functioning until I have the dig. potentiometer). -Image quality low/medium/high (this defines the prefix folder where images are stored). All components have been ordered from 7 different webshops: PJRC, EZtronics, Conrad, Floris.cc, Sparkfun Electronics, iPrototype.nl and AlphaCrucis. This page was last edited on 15 February 2017, at 02:58.